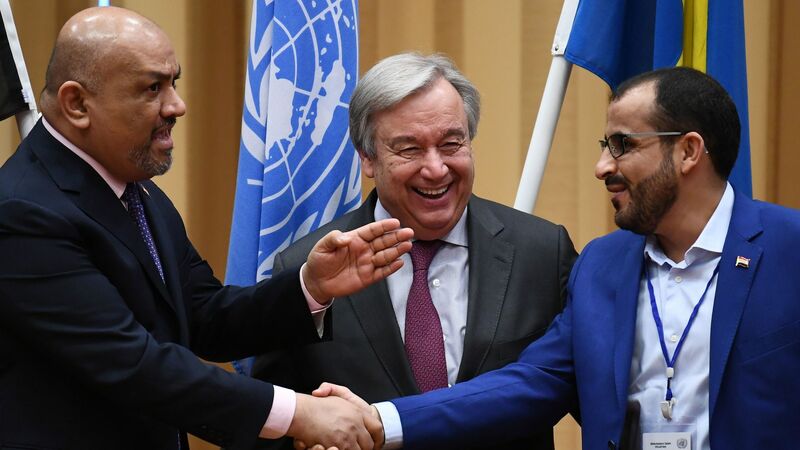 Yemen’s internationally recognized government and the Houthi-led rebel movement agreed to a cease-fire in the port city of Hodeidah and its surrounding governorate on Thursday, following a week of UN–sponsored peace talks in Sweden. Why it matters: The agreement follows mounting pressure from humanitarian groups; if it holds, it would mark a major diplomatic breakthrough. Since some 70% of basic commodities and relief aid flow through Hodeidah, keeping the port open is essential to staving off even more widespread food insecurity. Background: The Saudi- and UAE–led offensive has severely restricted commercial and humanitarian cargo. Some 65,000 people in Yemen already face famine conditions and another 16 million — an increase of more than 2 million in just three months — are on the verge of acute food insecurity. What to watch: A lot will need to go right to ensure the agreement becomes a reality on the ground. A UN Security Council resolution will have to lock in international support for the deal and lay out consequences for failure to comply with its terms. The UN must increase its presence in Hodeidah, assume management of the port and monitor the withdrawal of forces. Local forces will need to manage security — a daunting task in a conflict zone full of armed groups not party to the agreement. Finally, the UN and the parties will need to leverage these confidence-building measures into a wider political agreement to end the war. What’s next: The U.S. Senate voted Thursday to end U.S. support for the Saudi-led military campaign, though the prospects of that resolution in the House are unclear. Meanwhile, Martin Griffiths, the UN mediator, is expected to brief the Security Council on the agreement and the UN's commitments. The next round of peace talks is scheduled to take place in January.